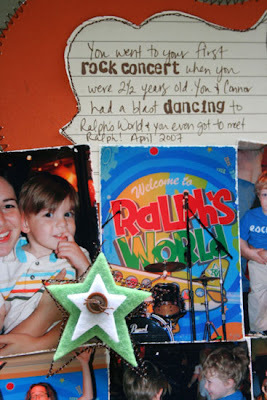 Creating my everyday: Do you remember your first concert? I remember my first concert. How could I not? It was Madonna's "Who's that girl" tour in 1987. I was 12. A woman who worked for my dad (who was in her 20's) took me. I got all glammed up with my mini skirt and rubber bracelets and teased hair. It was a total total blast!! I so wish my parents had been into photography so I could have had some photos of that! My second concert was INXS about a year later - I actually won tickets to that on the radio (one of the only things i've ever won, lol)! So, when it comes to number of photos on a layout, how many do you scrappers prefer? I have noticed that i'm very varied when it comes to number of photos. I have plenty of layouts with just 1 photo, and plenty with a lot like this one. I guess there is no rhyme or reason to my scrapping, lol! Anyway, I hope everyone is having a wonderful long weekend! I had a wedding shower for one of my good friends yesterday, and then my mom and I went shopping for a dress for the wedding. It was nice to get in some girly time with my mama! We've also had lots of downtime this weekend which is nice. The kids and I are off to run some errands, so I hope everyone has a great day!! What a cute, cute page, Staci! I love the die-cut shape and the bling going off the edge, and what a perfectly adorable title. Love that you have 6 photos on here, too. How fun to hear about your first concert experiences. My first ever concert was in 1980......The Police, Ghost in the Machine tour. Ah yes, good times! Staci, I love everything about this page. First off, your title cracks me up....too cute. I love the stars and the flourish and the felt and the overall design. The dimension and layers on this are fabulous! Oh, and BTW, INXS was my favorite concert evah! adorable pg.! oh man my first concert was Gloria Estafan and the Miami Sound Machine. LOL...seriously funny stuff. Man that was forever ago...like 1985..lol. Have a great day Staci! LOVE your LO, as always, and good for you using so many pics. I tend to always want to use 3 pics...in 2x3 size. It's my fave! Such a cute page! I vary also depending on how many pictures I want to fit on a page. can i say again that YOU ROCK fancy Pants! I'm jealous that you got to see Madonna at 12! I would have loved to see her then! My first concert was NKOTB. LOL! That lo is fabulous! Love the dimension on your los, the letters are fantastic! beautiful layout Staci. i never went to concerts as a teenager...hate that. 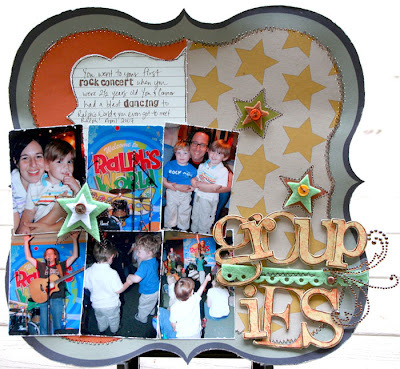 Great layout, Staci! 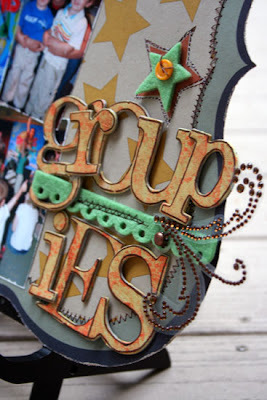 I love the idea with the bling with the backing on so it can hang out the page-- brillant! I am varied as well when it comes to # of pictures on a page. I like variety. My first concert was....hmmm, I don't know. We went to a few Christian concerts when I was in youth group. Maybe Petra? LOL! Such a fun page! Love how you did the bling!! And it looks like you all had such fun at the "concert"! First concert? Either Milli Vanilli or Paula Abdul. EEK. fabulous titlework ! such adorable pics you have to document Noah's first concert ! Sounds like you're having a fab long weekend , my dear ! I really love the way you extended the bling flourish off the edge of your page. The layout really reflects the fun you all had that day! What a wonderful page! I love the title (so funny), the stitching, the distressing of the photos, the perfect papers,everything is just beautiful! What an awesome page, Staci!! My first concert was New Kids on the Block and I'd give anything to have photos from it! Talk about neon color overload! A year ago I took my daughter, Mia, to her first concert. We saw Hannah Montana and I will never forget how excited she was. You've inspired me to do a layout about it now! this is way too cute!!!!!! love the title work on this one! what a cute page! Staci you do such awesome work! Sooooo cute!!!! Love the bling coming off of the page!!! My first concert was Sheena Easton circa 1982. My first concert that I begged to go to was Debbie Gibson - my dad knew one of the security guys who got us in for the sound check before the show and then we had awesome seats for the show. My BFF and I thought we were big stuff when we were escorted inside early (oh, to be 12 again!!!!). Glad you had some girly time with mama!!! I love those times and one day little Chloe will cherish it too!